1. Pre heat the oven to 180c. grease and line a spring foam cake tin. 2. Melt the butter and the sugar in a pan and bring to a simmer till the sugar has all dissolved. Take off the heat and leave to cool slightly, carefully add white chocolate, mix till it has all melted then add the ground almonds. 3. Separate the egg yolks to the whites. One by one add the yolks to the chocolate mixture and then add the salt. In a separate bowl whisk the egg whites to soft peaks then gently fold the whites into the mixture using a large metal spoon. Pour half the mixture into cake tin then sprinkle over 2/3 of the raspberries, then pour the rest of the mixture on top and bake for 30 – 40 minutes till golden in colour with a slight spring back on the cake when touched. Set the cake aside to cool, it will fall – that’s normal! 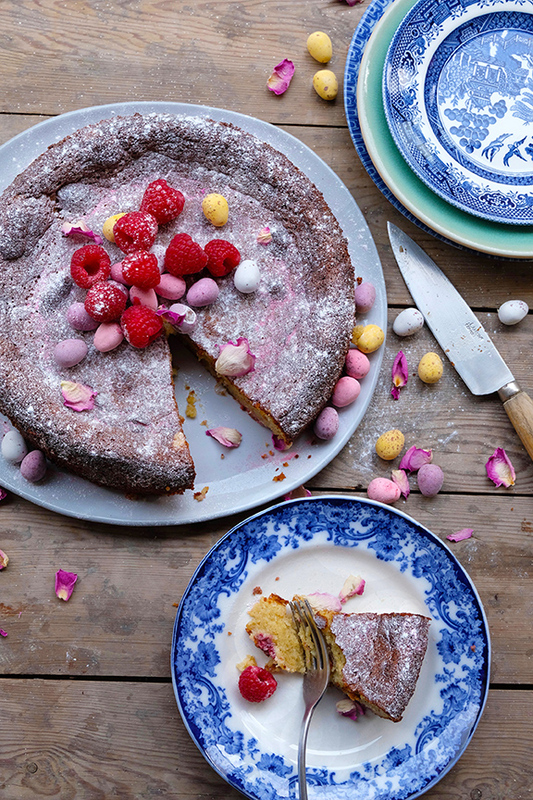 Decorate with mini eggs, edible flowers and raspberries, serve with crème fraiche.